A Super Prep All-American at famed Long Beach Poly High School, the tenacious and hard-hitting safety blossomed into one of the best defensive backs in Fresno State history and carved out an 11-year NFL career that included playing in Super Bowl XXXV for the New York Giants. As a junior, the 5-foot-11, 205-pounder set school and Western Athletic Conference records for tackles in a season with 198. He was named All-WAC as a senior and finished his Bulldogs career with a school-record 458 tackles. 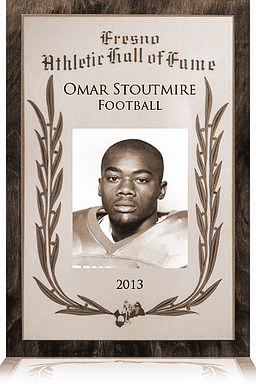 As a true freshman in 1993, Stoutmire was Fresno State's Scholar-Athlete of the Year. Selected by Dallas in the seventh round with the 224th overall pick of the 1997 NFL draft, Stoutmire made an immediate impact for the Cowboys with four tackles and a sack in his first regular-season game. Stoutmire started 14 games during his two seasons in Dallas. After one season with the New York Jets, in which he returned an intercepted pass 67 yards for a touchdown, Stoutmire crossed town and joined the Giants. Always versatile, he started 32 games, returned kickoffs and was a key performer in New York's dime defense and on their special teams for five seasons. Perhaps his best year was 2003, when he was third on the Giants in tackles with a career-high 109. In the 2004 season opener, however, Stoutmire tore a knee ligament and went on injured reserve. After being waived by the Giants, he signed with the NFC East rival Washington Redskins and again made his mark by making four tackles, including a sack, in a playoff victory over Tampa Bay. The following season he moved onto New Orleans and claimed a starting position for the Saints at strong safety. He helped the Saints into the playoffs by intercepting two passes and making 56 tackles in the regular season. Stoutmire then returned to the Redskins for his final NFL campaign. Following his NFL career, Stoutmire and his wife, Sheila, founded the North Texas Jackrabbits, a track and field program for youths 7 to 18.